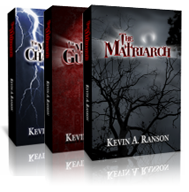 The Matriarch saga is smart, terrifying vampire reading. With each book, Kevin Ranson expands and deepens the world of Cedarcrest Sanctum and the forces that hold it together from within – and those that are trying to tear it apart from without. Read The Matriarch: Changeling today – but first read the novels that started it all. I mentioned in…previous reviews that I enjoyed the small scale of the books and, once more, whilst the vista stretched there wasn’t too much of a widening of horizons, an intimate feel was maintained. The writing is as strong as previous volumes, the story an examination of trust – or lack thereof – and the quote opening the blurb sums that up nicely. To be fair, the only part of this that disappointed was the message at the end that suggested that, whilst Janiss would be back in one more volume, it would be a final time. Not only does the story’s plot thicken and rise to literary bliss, but it also gets to the meat of the action without any unnecessary fluff. Ranson isn’t shy about creating genuinely strong lead female characters. In fact, the main protagonist, Janiss Connelly, has completely transformed from a mere uninspired human, into a fearless immortal heroine. As with the previous installments, you are intrigued from page one… To recap what I love with each book, the one thing that stays consistent, is the vampires themselves. They are modern, sleek and still extremely deadly without being parodies of themselves… Janiss has improved a lot as the series has gone on. Despite being unable to age, she has grown up quite a bit and has adapted to her role in the series. She’s quickly becoming a favorite vampire character to me. The new vampire in the book, Nancy, piqued my interest and the way she acts; her past and her sometimes questionable intentions kept me reading as fast as I could. It’s creepy — even when it isn’t trying to be. This is a great series for fans of vampires and mystery. It will keep your eyes glued to the page — the best in the series so far! I loved the first two books of the series and this installment was no different. It was awesome. To see these characters grow and mature you feel like you know them personally. Janiss and I could easily be friends… well, as long as we had a clear set of rules on how I am never under any circumstance to be breakfast, lunch, or dinner. Was hooked on this story from the first book. Loving the progress of the characters and more in depth information about them. I hope there are more books coming in the future.